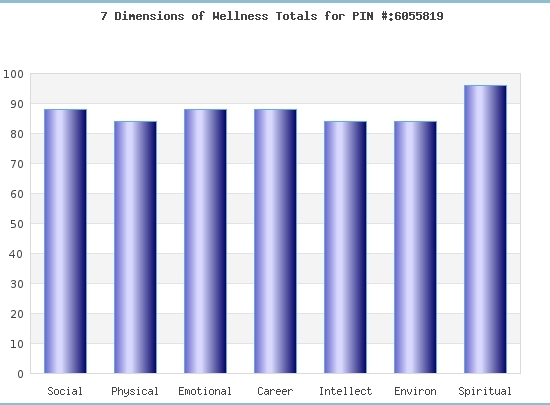 This 7 Dimensions of Wellness site is about personal wellness. The quiz you are about to take measures your perception of your overall wellness. Wellness is a way of living healthy, a way of living period. Personal wellness is defined as a dynamic process of becoming aware of and making conscious choices toward a more balanced healthy lifestyle. It includes learning new coping and communication skills that address both the positive and negative aspects of human existence. Wellness as wholeness is a way of cultivating health and well-being of individuals, communities, organizations, societies, and the environment by living and acting with awareness of the wholeness and the interconnectedness of all living systems. Wellness requires personal transformation vs transactions between individuals. Remembering that no one is perfect, and being well requires taking accountability/responsibility for your own experience. · Engaging activities and work. What is the difference between health-related quality of life, well-being, flourishing, positive mental health, optimal health, happiness, subjective well-being, psychological well-being, life satisfaction, hedonic well-being, and other terms that exist in the literature? Some researchers suggest that many of the terms are synonymous, whereas others note that there are major differences based on which dimensions are independent and contribute most to well-being. This is an evolving science, with contributions from multiple disciplines. Traditionally, health-related quality of life has been linked to patient outcomes, and has generally focused on deficits in functioning (e.g., pain, negative affect). In contrast, well-being focuses on assets in functioning, including positive emotions and psychological resources (e.g., positive affect, autonomy, mastery) as key components. Some researchers have drawn from both perspectives to measure physical and mental well-being for clinical and economic studies. Subjective well-being typically refers to self-reports contrasted with objective indicators of well-being. The term, "positive mental health" calls attention to the psychological components that comprise well-being from the perspective of individuals interested primarily in the mental health domain. From this perspective, positive mental health is a resource, broadly inclusive of psychological assets and skills essential for well-being. But, the latter generally excludes the physical component of well-being. "Hedonic" well-being focuses on the "feeling" component of well-being (e.g., happiness) in contrast to “eudaimonic” well-being which focuses on the "thinking" component of well-being (e.g., fulfillment). People with high levels of positive emotions, and those who are functioning well psychologically and socially are described by some as having complete mental health, or as "flourishing". In summary, positive mental health, well-being and flourishing refer to the presence of high levels of positive functioning—primarily in the mental health domain (inclusive of social health). However, in its broadest sense, well-being encompasses physical, mental and social domains. The reasons why well-being and related constructs should be measured and evaluating how these domains can be changed should help inform which domains, e.g., life satisfaction, positive affect, autonomy, meaning, vitality, pain) should be measured, and which instruments and methods to use. All material © Copyright 2017 and trademarked ® by Abbott Solutions, Inc. All rights reserved. The 7-Dimensional Wellness model includes the dimensions of Social, Physical, Emotional, Career, Intellectual, Environmental and Spiritual Wellness. 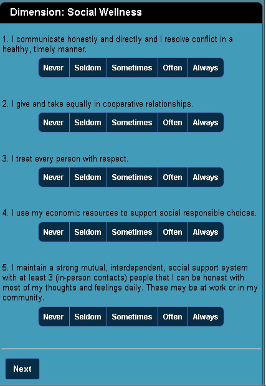 Social wellness is the process of creating and maintaining healthy relationships. The Social dimension of wellness encourages contributing to your human and physical environment for the common welfare of your community. It emphasizes interdependence and cooperation with others. Social wellness acknowledges that I am part of a family, community, group or circle, not the center of it. Social wellness includes the pursuit of harmony within your relationships and family that cultivated positive communication that is direct, honest and resolves conflicts. Physical wellness is not only the process of having a flexible, aerobically fit body. The physical dimension encourages regular physical activity that produces cardiovascular endurance, flexibility and strength to pursue everyday life and leisure activities. The physical dimension encourages knowledge and behavior consistent with good nutrition and discourages the use of tobacco, drugs and excessive alcohol consumption. It includes activities that contribute health and wellness including seat belt use, getting 7-8 hours of sleep per night, managing disease, implementing medical self-care and appropriate use of the medical system. Emotional wellness is the process of creating and maintaining a positive realistic self concept and enthusiasm about life. The emotional dimension wellness emphasizes an awareness of feelings and acceptance of the fact that you create your own feelings. Emotional wellness includes the degree to which you feel positive and enthusiastic about yourself and life. It includes the capacity to talk about feelings of fear, hurt, anger, sadness and joy, and to manage related behaviors. This includes being able to realistically asses your limitations, develop autonomy and to cope effectively with stress and ego. Career wellness is the process of making and maintaining choices that are meaningful and that contribute to your own personal growth, as well as to the growth of your employer and your community. The career dimension, occupation or personal work, includes preparing and continuing to prepare for work you enjoy. It includes helping to create a healthy organization that contributes to your own and other's well-being. Occupational wellness is related being responsible to your work and the ability to balance work with the rest of your life. Intellectual wellness is the process of using your mind to create a greater understanding of yourself and the universe. The intellectual dimension encourages creative, stimulating mental activities. An intellectually well person uses the resources available to expand knowledge, improve skills and increase the potential for sharing with and contributing to others. Intellectually well people use intellectual and cultural activities to question themselves, to re-examine judgments and questions authority. Environmental wellness is the process of making choices to create sustainable human and ecological communities, improving qualities in air, water, land and space. The environmental dimension recognizes that we are accountable for the quality of air we breathe, nourishment we seek, water to quench our thirst and the space to grow. The environmentally well person takes personal and social responsibility for creating sustainable communities that include all of earth's creatures, encourages minimizing use of disposable products, evaluates purchases and conveniences base upon environmental impact. Spiritual wellness is the process of 'experiencing life' while seeking meaning and purpose in human existence. Spirituality allows one to have consistency between values and behaviors. It includes the development of a deep appreciation for the depth and expanse of life, death and understanding of universal consciousness, (i.e. the 'master stories' or 'archetypes' that represent a commonality or biological imprints derived from the experience of the different races and are present in the unconscious of all individuals). Spiritual people are strongly aware of a wellspring of inner power and development of soul and that there are many paths to take in 'experiencing life' and that every spiritual tradition recognizes and teaches the basic precepts or laws of wise and conscious human conduct, (J. Campbell, The Power of Myth). Spirituality allows one to have consistency between values and behaviors because of the depth of understanding and precepts that re integrated into our 'spiritual Practice' within everyday life of work, family and relationships, (J. Kornfield, A Path with Heart). Generic principles of spiritual wellness include the acceptance of the concept of 'wholeness', i.e. connection with everything in creation. Spiritual wellness includes three working principles: acceptance of: (1) individual uniqueness, (2) diversity and (3) the need for community or bonding (Miriam Therese MacGillis, O.P. Genesis Farm). Becoming your own wellness coach is a concept developed for those who want to review the basics in personal wellness and take the next step toward transformation. You can become your own wellness coach by having a desire to be a responsible, self-directed and proactive individual. Sharing responsibility for community and compliance to "human values"
Employers, Teachers, Wellness Professionals, Trainers and Health Coaches will find that 7dimensionsofwellness.com offers complementary options to assist clients in taking the next steps for well being and that of transformation and insights into connection, consciousness and universal human values, a place in which one finds consistency in "head, heart and hands". What does this assessment do? The 7 Dimensions of Wellness Assessment/Quiz is the first step in making Wellness changes. The assessment provides a holistic measure of perception of the seven dimensions of wellness. The assessment requires being honest and authentic. You must "walk the talk" by being an active participant currently. The assessment is based upon what the brain believes/perceives and drives the "action" one takes by producing different physiological responses resulting in feelings from optimism to fear. 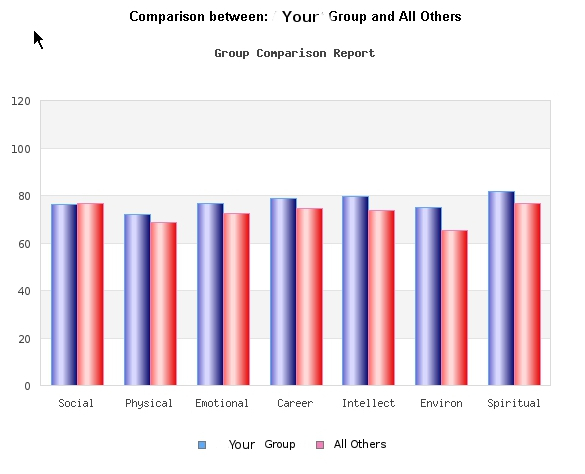 The individual Quiz Results Section outlines basic wellness concepts. Examples are given to demonstrate how wellness is a dynamic process and how each dimension is interrelated with the others. The assessment covers the 7 dimensions of wellness: Social, Physical, Emotional, Career, Intellectual, Environmental and Spritual. The free 7 Dimensions of Wellness Assessment takes from 20 to 30 minutes. The professional assessments can take up to 45 minutes, depending on which optional compnents have been selected. What kind of results do I receive? Everyone receives an individual report to view or print immediately after taking the quiz. 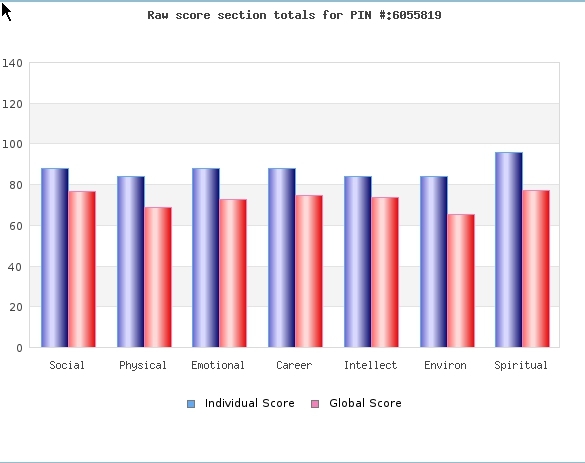 Professional subscribers receive additional reports: Percentile and Well-being, Individual with Group Average, Individual Scores with Group Percentiles, Individual Scores with Global Percentiles, Time Tracking. How do I use my assessment results? We have done the research for you and provide you with the following simple steps toward taking action. Questioning self worth and/or self efficacy. Shifting Perceptions in a positive direction and Improving Competencies. How many have taken the assessment? We have had 3473 participants complete our on-line quiz and receive a results summary. What other assessment options are available? What is Workplace or Corporate Wellness? An organized employer-sponsored program that is designed to support employees (and sometime, their families) as they adopt and sustain behaviors that reduce health risks, improve quality of life, enhance personal effectiveness, and benefit the organization's bottom line.” as defined by Leonard L. Berry, Ann M. Mirabito, and William B. Baum in What's the Hard Return on Employee Wellness Programs? Harvard Business Review. Dec. 2010 pp 1-9. The World Health Organization (WHO) defines health promotion as the process of enabling people to increase control over, and to improve, their health. It moves beyond a focus on individual behavior towards a wide range of social and environmental interventions. When providing wellness programming, health promotion defines the basic marketing and promotion of risk reduction health programs. These health programs are grounded in the disciplines of social marketing, health communication, business marketing and use of incentives that address consumer health "needs" and customer "wants." Comprehensive wellness strategies are based on population health research. Determinates of individual health are attributed to four main factors. Wellness however is based upon a holistic approach that requires individual transformation delivered through focusing on the 7 dimensions of wellness: Spiritual, Physical, Intellectual, Emotional, Career, Environmental, and Social. What is the Health Care Continuum Concept? Individuals moving from the center or neutral point to the left or treatment model moved to deteriorating states of health and finally premature death. Individuals moving to the right of center increased their levels of health and well-being through awareness, education and wellness growth. One of the core concepts of the continuum was that the Treatment Paradigm could only take individuals back to the neutral point, where the symptoms of disease have been alleviated. The Wellness Paradigm, which could be utilized at any point on the continuum, moved individuals toward higher levels of wellness. 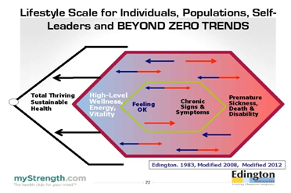 In 2012, Eddington introduced a new Health Care Continuum Concept in which he emphasized "Instead of aiming for a return to the status quo, a focus on positive health would move us beyond the status quo toward outcomes that exceed expectations. While risk reduction and health maintenance are noble, it is time to move the focus and efforts toward positive health potential through improved physical, mental, and social capabilities." Who is the Benefit professional? Benefit vs. Human Resource Professionals. What is Value-based Health Care? VBHC strives to remove barriers and align both financial and non-financial incentives and rewards for living healthy and productive lives by using prevention, (population health) health enhancement strategies (internal policy, rewards & management support) and health care services (prevention and managed care). V-BID is an innovative approach that can improve clinical outcomes and contain costs. The basic premise of V-BID is to align consumer incentives with value by reducing barriers to high-value health services and providers ("carrots" or intrinsic motivation) and discouraging the use of low-value health services and providers ("sticks" or extrinsic motivation). When "carrots" are coupled with "sticks" in a clinically nuanced manner, V-BID improves health care quality and controls spending growth. What is a Wellness Benefit Manager? Please select any options that apply. I am requesting permission to Duplicate or Publish the 7 Dimensions of Wellness Question set and/or other copyrighted materials contained within the web site. I am interested in obtaining a professional group account on a trial basis. I am applying for a discount based on not-for-profit status I am interested in using the 7 Dimensions of Wellness for research. I would like to know more about your professional consulting services. I have some questions about the assessments, the setup, the pricing, etc. In 1990, the University of Wisconsin-Stevens Point academic program in Wellness and Health Promotion created the 7 dimensions of wellness assessment under the direction of R. Anne Abbott, PhD. (Professor Emeritus of Health Promotion). 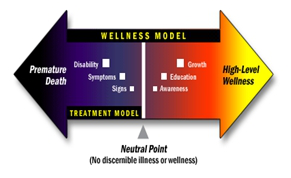 The 7-dimension model was the first to include the environmental dimensions of wellness. 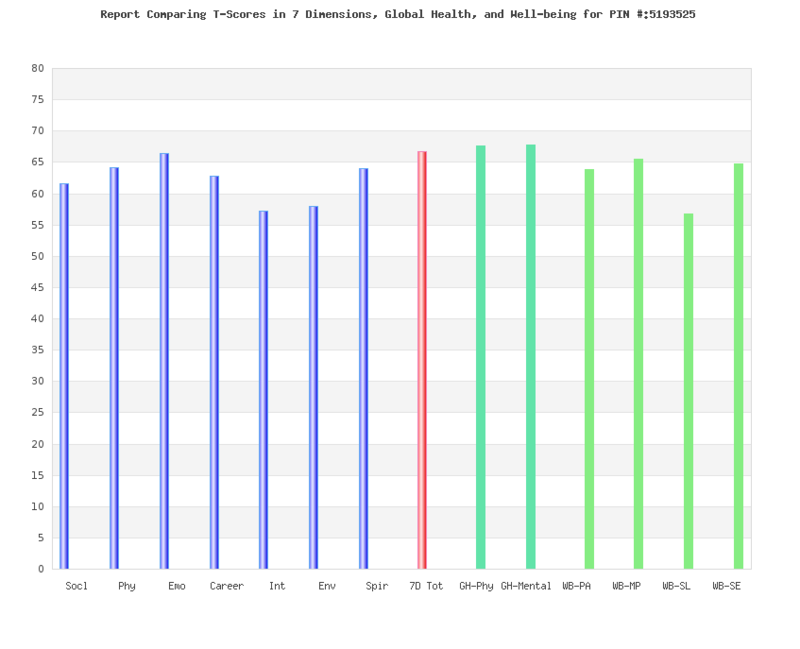 Although the 7 dimensional model has been adapted and replicated around the globe, no research to determine validity or reliability has ever been published. We are seeking transparency and support in proposing a Well-Being Study, Thanks you for your consideration! If you would be interested in working with us please contact us. Thank you for sending your message to Abbott Solutions! We will try to respond to you withing the next few days. In 1990, the University of Wisconsin-Stevens Point academic program in Wellness and Health Promotion created the 7 dimensions of wellness assessment under the direction of R. Anne Abbott, PhD. (Professor Emeritus of Health Promotion). The 7-dimension model was the first to include the environmental dimension of wellness. Although the 7 dimensional model has been adapted and replicated around the globe, no research to determine validity or reliability has ever been published. We are seeking transparency and support in proposing a Well-Being Study. Thank you for your consideration! Congratulations! You are now eligible to download your Certificate. 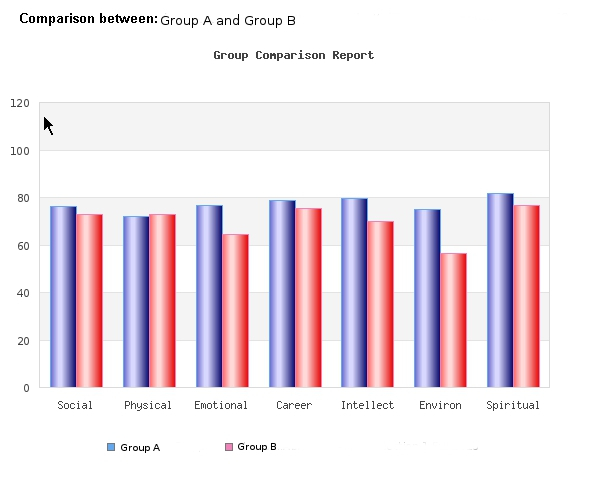 Individual Results Report: This is part of the Individual Report which shows results in each of the 7 dimensions. This report is available in the free, standard and advanced individual accounts. 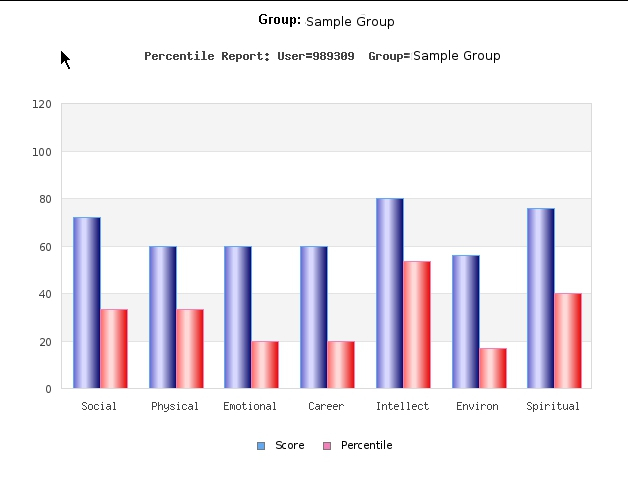 Individual vs. Group Percentile Report: This report shows your individual results in percentile in comparison with the average percentile results in each of the 7 dimensions for all users who have taken the assessment. This report is available in the standard and advanced individual accounts. 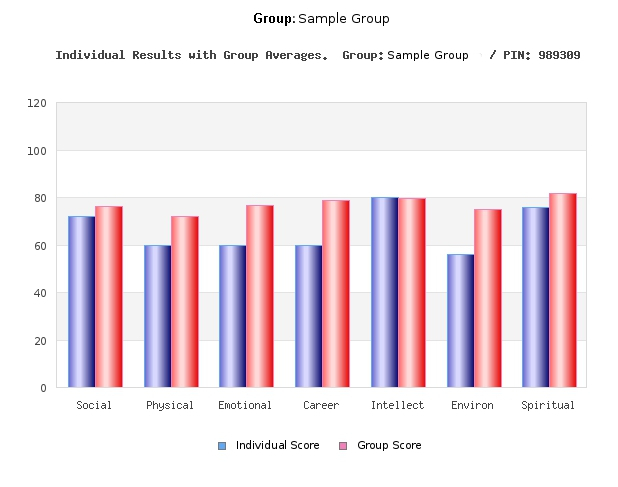 Individual vs. Group Results Report: This report shows your individual results in comparison with the average results in each of the 7 dimensions for all users who have taken the assessment. This report is available in the standard and advanced individual accounts. 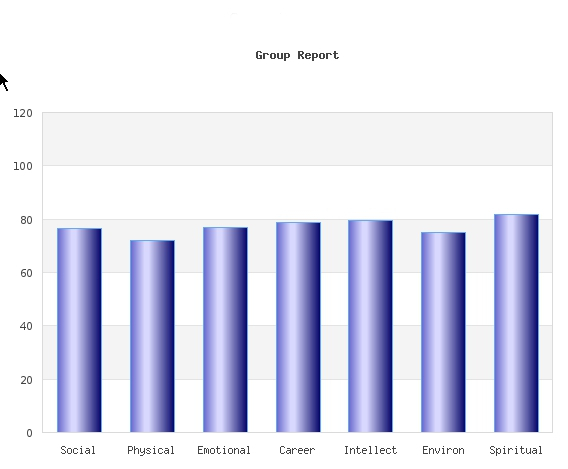 Time Tracking Report - Bar Graph Format: This report shows your individual results in each of the 7 dimensions over time. The bars are color-coded by date and are clustered in each dimension. This report is only available in the s advanced individual account. Users with the Advanced Individual Account can take the assessment up to 5 different times. 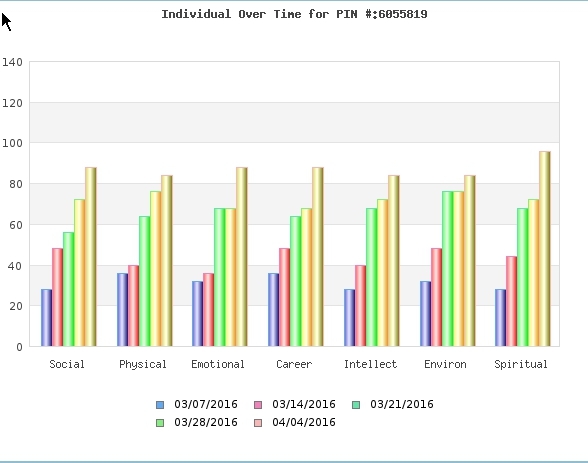 Time Tracking Report - Line Graph Format: This report shows your individual results in each of the 7 dimensions over time. Each color-coded line represents a date the assessment was taken. 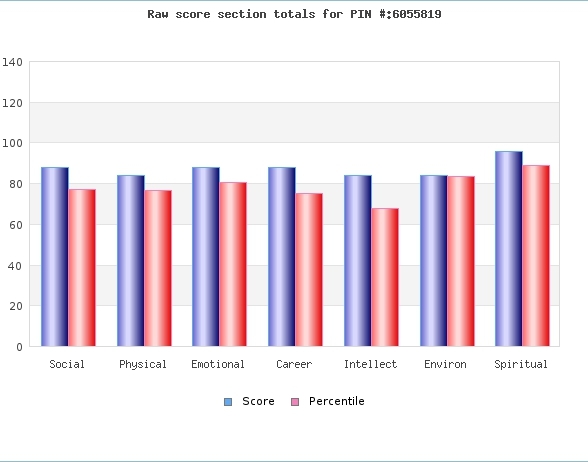 the 7 dimensions are represented on the vertical axis with the scores on the horizontal axis. This report is only available in the s advanced individual account. Users with the Advanced Individual Account can take the assessment up to 5 different times. Group Accounts for Employers, Teachers, Wellness Professionals, Trainers, Health Coaches. Wellness professionals, trainers and health coaches will find that 7dimensionsofwellness.com offers complementary options to assist clients in taking the next steps for well being and that of transformation and insights into connection, consciousness and universal human values, a place in which one finds consistency in "head, heart and hands". About the Author: Charlie Grantham has been thinking about and writing about the implications of the digital revolution on society and the individual since the 1980s. About the Author: Brene Brown, Ph.D., LMSW is a research professor at the University of Houston Graduate College of Social Work. She has spent the past decade studying vulnerability, courage, worthiness, and shame. Brene Brown is a popular contributor to TED Talks with over 15 million views. About the Author: Barbara Lee Fredrickson is an American professor in the department of psychology at the University of North Carolina at Chapel Hill, where she is the Kenan Distinguished Professor of Psychology. She is also the Principal Investigator of the Positive Emotions and Psychophysiology Lab (PEPLab) at the University of North Carolina at Chapel Hill. Fredrickson is a social psychologist who conducts research in emotions and positive psychology. Her main work is related to her broaden-and-build theory of positive emotions, which suggests that positive emotions lead to novel, expansive, or exploratory behavior, and that, over time, these actions lead to meaningful, long-term resources such as knowledge and social relationships. She is the author of Positivity (2009), a general-audience book that draws on her own research and that of other social scientists. She also released a new book in January 2013, Love 2.0, which discusses the supreme emotion of love, micro-moments of connection as well as how love can affect your biological and cellular make-up over time. About the Author: Todd B. Kashdan, Ph.D. is scientist, public speaker, and a professor of psychology at George Mason University. He is director of the Laboratory for the Study of Social Anxiety, Character Strengths, and Related Phenomena at George Mason University. His research has advanced our understanding of why people suffer, with an emphasis on the transition from normal to pathological anxiety. His other research has advanced our understanding of the nature of well-being, with an emphasis on the critical functions of curiosity, meaning and purpose in life, and psychological flexibility to living a well-lived life. He is one of the first people in the world to teach college courses on the science of well-being, and soon after, brought this science to the general public and business organizations. How you feel can affect your ability to carry out everyday activities, your relationships, and your overall mental health. How you react to your experiences and feelings can change over time. Emotional wellness is the ability to successfully handle life's stresses and adapt to change and difficult times. What surrounds you each day in your home, work, or neighborhood and the resources available to you can affect your health. You can�t always choose what's in the environments you live, work, or play in. But taking small steps to make your environments safer and limiting your exposure to potentially harmful substances can help keep you healthier. His Holiness the Dalai Lama speaking on taking daily responsibility to change our environment in response to global warming in this short clip from an interview given to Sofia Stril-Rever in Oxford, UK on September 15, 2015. About the Author: The 14th Dalai Lama is the current Dalai Lama, as well as the longest lived incumbent. Dalai Lamas are the head monks of the Gelug school, the newest of the schools of Tibetan Buddhism. He won the Nobel Peace Prize in 1989, and is also well known for his lifelong advocacy for Tibetans inside and outside Tibet. Our mission is to create a more just, compassionate and healthy world by nurturing personal and professional integrity and the courage to act on it. Esalen is a leading center for exploring and realizing human potential through experience, education, and research. We work toward the realization of a more humane and all-embracing world. We are committed to serving the evolution of consciousness and culture on the planet by building and nurturing a global transformative learning community that brings visionaries and wisdom teachers together with passionate learners for the purpose of creating deep transformation at all levels. We believe in the transformative power of love, love that protects us in our vulnerability while also impelling us to tend to the needs of others. We believe that forgiveness can also be transformative, a process that further extends the healing power of love. We accept that these forces have power: power to heal, and power to transform even the most difficult, troubled situation into something that is generative, affirming, and life-giving. In a world that seems dominated by aggression and separation, we are part of a broad and deep yearning for something different. The Findhorn Foundation is a spiritual community, ecovillage and an international centre for holistic learning, helping to unfold a new human consciousness and create a positive and sustainable future. Plum Village, near Bordeaux in southwest France, is the largest international practice center in the Plum Village tradition, and the first residential community to be founded by Zen Master Thich Nhat Hanh (Thay) in the West. We envision an education that promotes the exploration of meaning, purpose and values and seeks to serve our common human future. An education that enables and enhances personal introspection and contemplation leads to the realization of our inextricable connection to each other, opening the heart and mind to true community, deeper insight, sustainable living, and a more just society. About the Author: Jo Marchant is an award-winning science journalist and author. She has worked as an editor at New Scientist and at Nature and writes on topics from the future of genetic engineering to underwater archaeology. About the Author: Jon Kabat-Zinn is Professor of Medicine Emeritus and creator of the Stress Reduction Clinic and the Center for Mindfulness in Medicine, Health Care, and Society at the University of Massachusetts Medical School. Kabat-Zinn was a student of Buddhist teachers such as Thich Nhat Hanh and Zen Master Seung Sahn and a founding member of Cambridge Zen Center. His practice of yoga and studies with Buddhist teachers led him to integrate their teachings with those of science. He teaches mindfulness, which he says can help people cope with stress, anxiety, pain, and illness. The stress reduction program created by Kabat-Zinn, called Mindfulness-based stress reduction, is offered by medical centers, hospitals, and health maintenance organizations. About the Author: David L. Katz is a nutritionist and the founding director of the Prevention Research Center at Yale University, as well as an associate professor of public health practice at the Yale University School of Medicine. In 2000, Katz began advocating for integrative medicine when he founded the Integrative Medicine Center at Griffin Hospital in Derby, CT. He has been a member of the governing board of the American College of Preventive Medicine since 2002, and has also been president of the Association of Teachers of Preventive Medicine since 2004. Addiction isn't invincible. We know what needs to be done, and we know we need to do it together. The solution lies in prevention, treatment and government action. We are rallying families, employers, medical leaders, and passionate individuals like you to make this possible. Center on Addiction has spent more than 25 years conducting research and finding the most effective strategies to combat addiction. Now we're putting them into practice. About the Author: Jillian Michaels is an American personal trainer, businesswoman, author and television personality from Los Angeles, California. Fitness Trackers are wearable devices that monitor and store information about your activity levels, including walking, running, heart rate, blood pressure and even blood oxygen levels. These products can be synced with iOS and Android apps which in turn can provide useful historical tracking of your daily activity levels. Band - Your UA Band measures sleep, resting heart rate, steps, and even workout intensity when worn with UA Heart Rate. Wear it ALL THE TIME.. Scale - Track your body weight, body fat percentage, and progress towards your weight goal. Step on it EVERYDAY.. Heart Rate - Train as smart as possible by wearing the chest strap while you work out to track your heart rate. See it in real-time when you wear with UA Band.. Get a FREE 1-year membership to MyFitnessPal Premium and MapMyFitness MVP with your purchase of UA HealthBox™..
E-Cigarettes seem to be everywhere these days. But are they safe? Get the facts. About the Author: Daniel J. Siegel received his medical degree from Harvard University and completed his postgraduate medical education at UCLA with training in pediatrics and child, adolescent and adult psychiatry. He served as a National Institute of Mental Health Research Fellow at UCLA, studying family interactions with an emphasis on how attachment experiences influence emotions, behavior, autobiographical memory and narrative. About the Author: Candace Beebe Pert (June 26, 1946 - September 12, 2013) was an American neuroscientist and pharmacologist who discovered the opiate receptor, the cellular binding site for endorphins in the brain. As a mere graduate student, in 1972 Candace Pert discovered the brain's opiate receptor - the cellular site where the body's painkillers and "bliss-makers", the endorphins - bond with cells to weave their magic. Pert's discovery led to a revolution in neuroscience, helping open the door to the "information-based" model of the brain which is now replacing the old "structuralist" model. About the Author: Richard J. Davidson, PhD, is a renowned neuroscientist and one of the world's leading experts on the impact of contemplative practices, such as meditation, on the brain. He is the founder of the Center for Investigating Healthy Minds at the Waisman Center, University of Wisconsin-Madison. He is perhaps best known for his groundbreaking work in studying emotion and the brain. A friend and confidante of the Dalai Lama, he is a highly sought after expert and speaker internationally. Time magazine named him one of the most influential people in the world in 2006. About the Author: What drives our desire to behave morally? Neuroeconomist Paul Zak shows why he believes oxytocin (he calls it "the moral molecule") is responsible for trust, empathy and other feelings that help build a stable society. From the time you're born, your relationships help you learn to navigate the world. You learn how to interact with others, express yourself, conduct everyday health habits, and be a part of different communities from those around you. Positive social habits can help you build support systems and stay healthier mentally and physically. About the Author: Sharon Salzberg is a New York Times Best selling author and teacher of Buddhist meditation practices in the West. In 1974, she co-founded the Insight Meditation Society at Barre, Massachusetts with Jack Kornfield and Joseph Goldstein. Her emphasis is on vipassan? (insight) and mett? (loving-kindness) methods, and has been leading meditation retreats around the world for over three decades. All of these methods have their origins in the Theravada Buddhist tradition. Her books include Lovingkindness: The Revolutionary Art of Happiness (1995), A Heart as Wide as the World (1999) and Real Happiness - The Power of Meditation: A 28-Day Program (2010), which was on the The New York Times Best Seller list in 2011. About the Author: Jack Kornfield is an American author and teacher in the vipassana movement in American Theravada Buddhism. He trained as a Buddhist monk in Thailand, Burma and India, including as a student of the Thai monk Ajahn Chah. He has taught meditation worldwide since around 1974. In 1975, he co-founded the Insight Meditation Society in Barre, Massachusetts, with Sharon Salzberg and Joseph Goldstein, and subsequently in 1987, Spirit Rock Meditation Center in Woodacre, California. Wellness is a philosophy, a way of living healthy. University of Wisconsin-Stevens Point (UWSP) has a long history in helping create the wellness movement. The Health Promotion and Wellness (UWSP-HPW) academic program introduced in 1987 and continues to produce professionals with a Health Promotion and Wellness Bachelor of Science degree. Over the last 2 decades, UWSP-Health Promotion and Wellness academic program has promoted that survival of the species requires more than fitness and created the seven dimensions of Wellness. Why seven dimensions you might ask? In 1990 our student marketing class felt it was important to add the dimension of environmental and submitted the first design for a 7 dimensional model. It was felt six dimensions implied perfect balance, while seven implied fluidness, i.e. we are always in motion, transforming energy, constantly changing as we try stay in a balanced state of homeostasis. As individuals and communities, we embraced this emerging world view of interconnectedness. Several of the dimensions are specific to internal social, physical, emotional, intellectual mind-body connections. Others, career, environmental and spiritual represent external and we constantly balance between the internal and external as a whole systems healing process. An organized employer-sponsored program that is designed to support employees (and sometime, their families) as they adopt and sustain behaviors that reduce health risks, improve quality of life, enhance personal effectiveness, and benefit the organization's bottom line.â€� as defined by Leonard L. Berry, Ann M. Mirabito, and William B. Baum in What's the Hard Return on Employee Wellness Programs? Harvard Business Review. Dec. 2010 pp 1-9. Abbott Solutions, Incorporated was founded by R. Anne Abbott, PhD, an accomplished administrator, published author, and seasoned public speaker and facilitator. Abbott works with caring organizations that desire to successfully bridge efforts between multi-disciplined professionals in order to provide exceptional services to clients, consumers, and employees. Abbott is the Principal Owner of Abbott Solutions, Inc.
"I believe may life's work, my practice, is to act as the bridge between good intentions and measurable outcomes, where people and community can make a difference and technology can be used to enhance the human capacity!" Abbott Solutions, Inc., is a health care management consultant group that supplies strategic planning, operational management expertise, prepares research and response to complex questions. Abbott Solutions provides employers objective, customized and cost effective solutions to reduce health care cost, improve return on investment [ROI] and provided wellness program design for your corporate and employee wellness health benefit and wellness plans. Current projects include: Professional coaching, consulting, and on-line course development for wellness and benefit professionals desiring to incorporate value based health care management into health benefits and wellness plans. Dr. Abbott is a Professor Emeritus in Health Promotion and Wellness at the University of Wisconsin-Stevens Point (UWSP) and serves as a Senior Consultant for the National Wellness Institute, Inc.
Abbott currently serves on NWI's Board of Directors and on the Academic Accreditation Team for Bachelor's, Master's and PhD level graduate programs with emphasis in Health Promotion and Wellness. Abbott continues to serve on the Board of Experts for publication of The Exercise Standards and Malpractice Reporter. (1997-2011) Professor and Past Academic Director, UWSP Academic Director, UWSP-University of Wisconsin Extension (2010-2011). Contributed wellness and health promotion expertise and leadership to develop on-line learning at UWSP. Worked collaborative with 3 other universities and UW-Extension to develop an on-line bachelor completion degree in Health and Wellness Management (HWM). Spearheaded academic curriculum development for training Health Promotion and Wellness, and Health Promotion and Health Protection professional degrees. Led innovative professional training program to achieve 3 national "Best Program Awards"
Director, Employee Wellness Programs for 1100 university employees (1987-1997) and 3500 hospital employees (1979-1987). International Foundation Education - Benefits- Compensation. Health Benefit Plan Basics, Choice Based Benefits, Health Care Cost Management - Certificate in Health Care Plans.(2013). 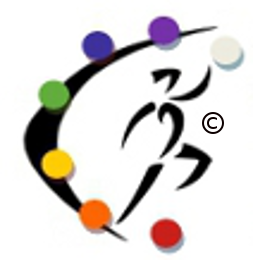 Personality Resources International (PRI), the Color People. Identity Mapping and the Four Ways System. (2012). National Wellness Institute, Certified Wellness Practitioner (2009-2014). American College of Sports Medicine Program Director (1975-2007). New England Institute of Gestalt Therapy, Boston (1987). What does the Quiz Do? The SPECIES-7 Dimensions of Wellness Assessment/Quiz is the first step in making Wellness changes. The wellness assessment provides a holistic measure of perception of how one views their wellnees within the seven dimensions. Perception is based upon what the brain believes or perceives to be true. Perception drives the behavioralaction one takes. The individual Quiz Results Section outlines basic wellness concepts. Examples are given to demonstrate how wellness is a dynamic process and how each dimension is interrelated with the others. Professional Group plans can access Quiz directly and have access to the data for their employees or participants. Please note the SPECIES - 7 Dimensions of Wellness Assessment/Quiz is not a Biometric/Health Risk Assessment (HRA) or medical base survey. This section encourages and provides simple steps toward taking action. These steps include Awareness and Knowledge, Questioning Self Worth, Shifting Perceptions, and Taking Actions. 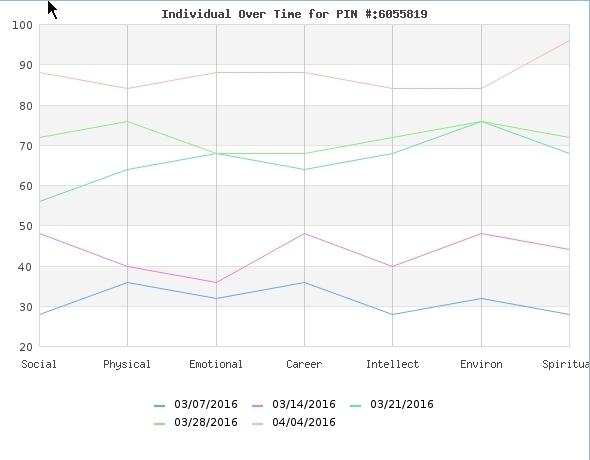 You can use the SPECIES-7 Dimensions of Wellness Assessment/Quiz to measure wellness progress over time, or simply increase awareness in beginning a wellness program or re-designs of health promotion programs. Basic best practices for health and wellness are supplied by links to the best free Internet resources. How do "Selected References for Consumers" Work? Select references help consumers find best and up-to-date information beyond diet and exercise and that are transformational in nature. For example, research in neuroplasticity of the brain currently supports that the brain can be altered by simple meditation techniques when incorporated into a disciplined practice. Expert presenters provide useful techniques and demonstrations through selected videos, YouTube talks and recommended books. These practices are known to provide personal transformation vs. transactions for participants exploring these methods. Trust is based upon transactional relationships vs. ROI calculations. Reports: Who can get the data results? Assessment/Quiz provides 3 levels of report access. 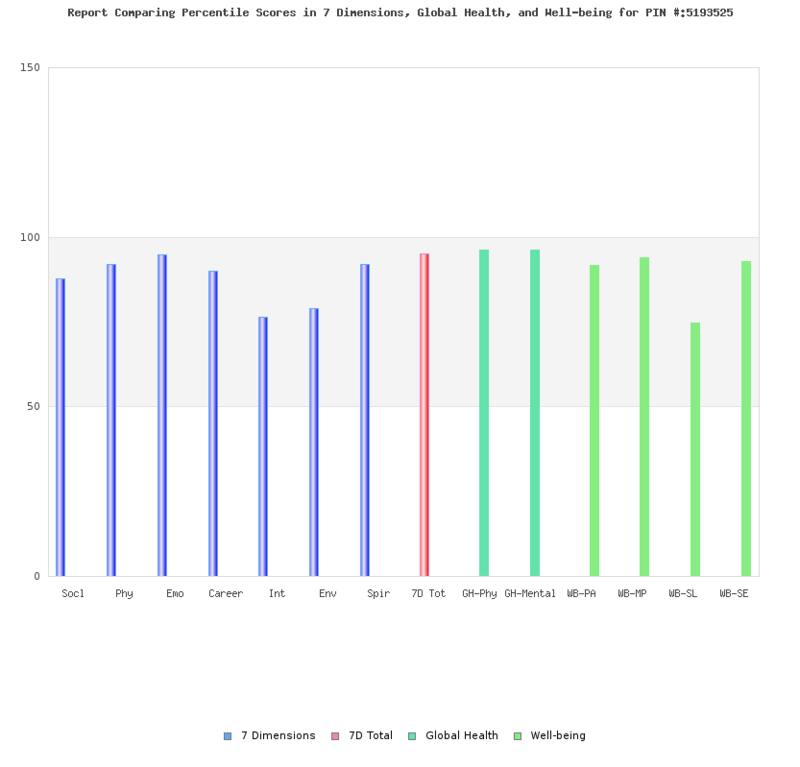 Advanced Individual Reports– Users have access to their Individual Report and recommendations, an Individual/Group Comparison Report and an Individual Percentile Analysis Report and Time-Tracking Reports. Professional Group Plan– Individuals assessment takers get Advanced Individual Reports as described previously. The Plan Administrator has access to aggregated Group Reports, Group Comparison Reports, Demographic Reports and Ad Hoc Filtering Reports. Plan Administrators can also manage their own groups (e.g. departmental) and download all de-identified raw data. While their account is active, Plan Administrators have full access to and own their aggregated data as defined in their individual contracts. Free consultation on determining your program and technical needs. Free technical assistance in merging SPECIES-7 Dimensions of Wellness Assessment/Quiz into existing health and wellness programs. Free on-line technical support for quiz operation. Quiz cost are based on volume of use. 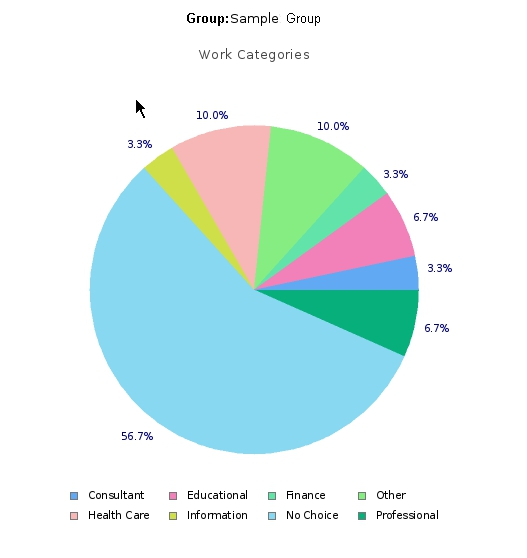 Customization available: Through the Professional Group Plan, employers, consultants, wellness professionals can have access to the data for their employees or participants. Based on volume, or complexity of customer needs, we can customize or adapt this product to individual specifications for a reasonable fee. Onsite consulting to integrate wellness and benefits, available on an additional fee basis.